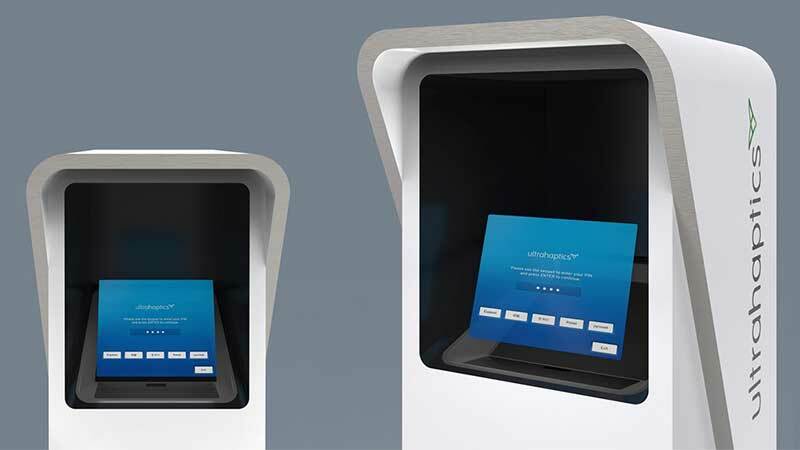 At CES 2018 Ultrahaptics teamed up with Japanese firm, Asukanet, to create an ATM comprising of mid-air haptic holographic display. Visitors lined up to try the demonstration, withdrawing virtual money by interfacing with a display which appeared, as if by magic, floating in mid-air. Ultrahaptics’ technology added the sense of touch, giving the visitors haptic feedback as they selected buttons on the display. Asukanet’s technology sends light, emitted by a digital image, through a special glass plate, and collects that light on the other side of the plate, at the same distance, to create an identical image in mid-air. Users can reach out and touch the projected image. The image is projected to be seen clearly only by the user standing directly in front of the display, allowing for increased privacy. The CES demonstration combined these holograms with a Leap Motion® camera module, which tracked the user’s hand. By processing the data from the tracking sensor, the display became interactive, responding to the user’s hand movements. The experience was enhanced by the use of Ultrahaptics’ unique mid-air haptic technology. The visitors’ hands, tracked by the Leap Motion® camera module, received tactile feedback as they interfaced with the visuals. Every input was confirmed by stimulating the user’s touch receptors, making the interface intuitive and responsive to use. Ultrahaptics hosted the demo on its booth on the main show floor at CES, as one of a collection of use cases across a range of applications from VR, AR, home controls and even in a completed customer product, a casino gaming cabinet.